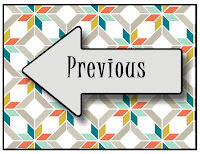 Hello, and welcome to another wonderful blog hop from the Stampin' Addicts! We are so happy that you stopped by to see some of the ways to use the wonderful FREE items coming next week for Sale-A-Bration* (aka SAB). 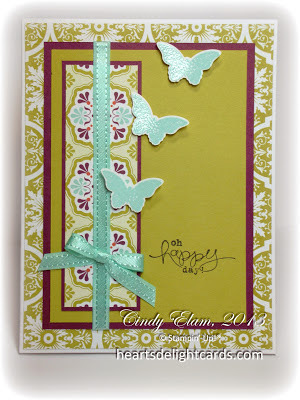 You probably just came from Rhonda's blog, The Stampin' Bunny, where she featured the Vine Street Embossing Folder. She always knocks my socks off with her creativity! You can follow the link near the bottom to continue on to Heidi's blog when you're finished here, or click HERE for a complete list of the hop stops. Today I'm featuring the Bloomin' Marvelous stamp set, and I must say, it certainly is! The first card uses the Sycamore Street Designer Series Paper (SAB item) as a starting point. It's easy to choose coordinating colors from the DSP, so this card has Summer Starfruit and Rich Razzleberry as the main colors, with some accents of Pool Party to give it "pop". The little butterfly was heat embossed with Pool Party embossing powder to give a bit of shine, which matches the Pool Party Satin Ribbon (another SAB item!). For the second card I toned it down a bit and chose colors to play up the Tangerine Tango Satin Ribbon (more from the Sycamore Street pack). I thought Basic Gray was the perfect background to show off the flowers. This is a very mailable card - no bulky bows or brads to jam in the PO machinery! And lastly, here's a pretty, feminine card with a soft pink bow holding the little bouquet, kind of reminiscent of a nosegay (and I'll bet half of you don't know what that is, heehee!). The doily really helps the flowers stand out, don't you think? Now this card would need to be hand-delivered! Thanks so much for stopping by today. Next in line is Heidi's blog, Running w Scissors Stamper, where she's going to wow you with the Feeling Sentimental set. I love the fun facts she has about the bicycle image! 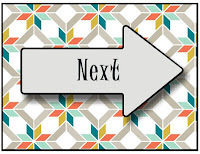 When you have a chance, stop by the Stampin' Addicts and say Hi! Membership is free and anyone who loves Stampin' Up! is welcome to join, whether SU demonstrator or hobby stamper. *What is Sale-A-Bration, you ask? Only the biggest sale of the year from Stampin' Up! You can earn free goodies (with a qualified purchase), and this year has the best selection of products I've ever seen! Love the grey card! Very elegant. Oh, blogger isn't liking me today. Sorry if you get a bunch of comments from me. Great projects, Cindy! Love your nosegay with the doily background - fabulous!! I love ewhat you did with this set. Ayee, cutting those flowers! I love the nosegay card. it would be great for as bridal shower card. Gorgeous cards Cindy!! I LOVE your Out of the Box card so much! So detailed and gorgeous! Such a gorgeous cards! Those flowers look great and so different in each of those color schemes. Great job showcasing this set! Wow! Love all your detailed cutting. It adds such pretty dimension to the cards. Also the choice and placement of the focal dsp on the first card is stunning. 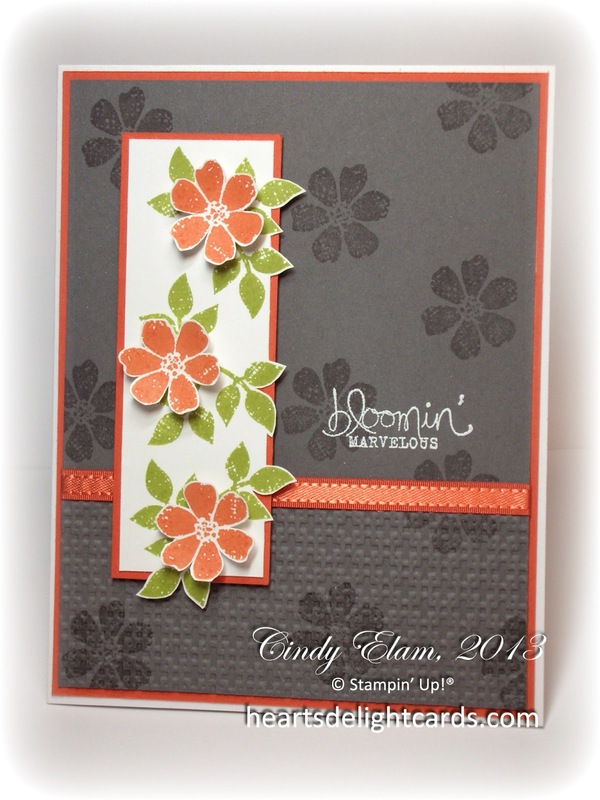 Love the color combo you chose for the bloom I' card- very elegant. Wow! No fussy cutting here...these are stunning! I'm not even sure which is my favorite, but I have to say that I really didn't care that much for the Summer Starfruit until I saw your card. Now I might have to experiment a little! Lovely cards, as always. The colors in the first are so much fun. Mailable cards are always an issue for me, so I am glad to see a top-notch example! I love all three of your cards, they are gorgeous! I really appreciate the first one with your generous use of Summer Starfruit, as I find it a difficult color to work with except in small doses. You've shown how well it can work as a very rich and wonderful color, especially in complement to Rich Razzleberry. Wow -- love that gray card! That color combo gives this set another personality! Holy cow, the Basic Gray and Tangerine Tango card really knocks my socks off! How STUNNING!! And now I'm wondering how have I lived this long without Basic Gray? And your nosegay card? Hello, PERFECT BOW! OK, there is no way I could pick just one as a favorite, these are all gorgeous! Your big fluffy bow on the last one is fabulous btw! Digital Content CDs for a BUCK?! SUOC63, Are You Feeling the Love? Sale-A-Brate Good Times, Come On!